We have played half the thirty-two games of the Nations Cup, and as yet, only one team cannot reach the knock out stages. Some teams chances are more than others though, and Senegal in particular have done a lot worse than expected, prompting their coach, Henri Kasperczak to resign his position immediately. It would have been little surprise had he been sacked before the third game anyway, and certainly he would have left the job soon after returning to Senegal empty handed, and probably now without a knock out game played. Kasperczak can expect to be joined by the majority of coaches whose teams lose out in the group stages, and a few others that go further but still do not reach expectations. 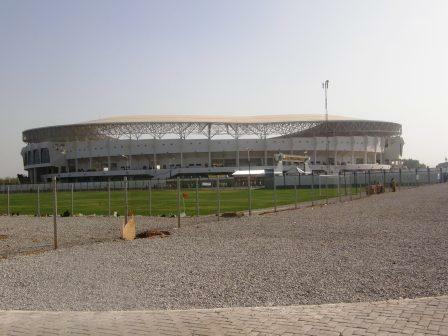 It is Group A that interests most Ghanaians, and the match against Morocco is key to their interests. As coach, Claude le Roy has been around long enough to know his job is not secure should he not get a result, but then with a dozen clubs already in his CV, no one would be surprised if he moved again, even if Ghana were to win the contest. His fellow Frenchman, Henri Michel is in a similar situation with the Morocco team. 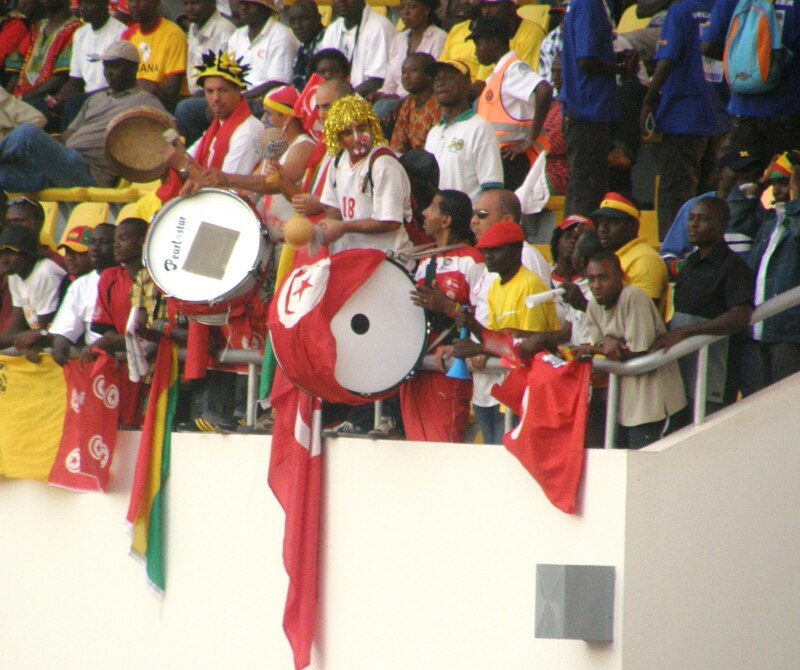 In the other match of the group, Guinea is expected to beat Namibia and therefore reach six points. Ghana already has six points, and so will go through (as group winners) and knock out Morocco if they win or draw. I personally expect Ghana to achieve this, and to go further in the tournament, but many of the locals are extremely nervous that Morocco will win, leaving three teams on six points. In this case, the head to head counts first, hence should Morocco win by two (or more goals), they will win the group, Guinea (assuming a win) come second, and Ghana are out. A Morocco win by 1-0 means they will have scored and conceded three in the three team section, while Guinea have four (and therefore win the group), while Ghana have only two (out again). 2-1 also does not favour Ghana, but 3-2 leaves the possibility of the hosts and Guinea tied for second place  then the overall groups goal difference comes in, and Ghana again look like losing out after only putting a single goal past Namibia. The odd mathematical chance of Namibia qualifying would require that both they and Ghana win today. 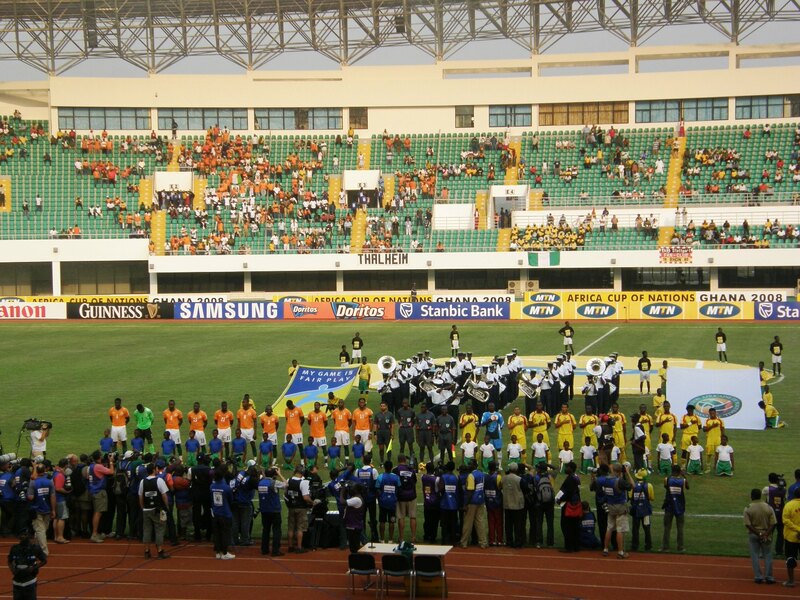 Tomorrow, the better match will again be in Accra, where the Ivory Coast play Mali. The Ivorians were less then overwhelming in beating Nigeria in their first match, but then comfortably motored past Sudan. With six points, they are through to the next round, and a draw will see them confirmed as group winners. A group will also suit Mali, whose 0-0 draw against Nigeria was the dullest match of the tournament so far, but goes a long way to putting them through. Nigeria, who have been the most disappointing team so far, especially when the experience in the squad is reckoned with, should beat Benin, but this will only help should Mali lose their final game. On Wednesday, action moves further North, with games in Kumasi and Tamale in group C. Egypt were stunning in the first game, and comfortable in the second and already have six points, like the hosts, they only need a draw against Zambia to be confirmed as group winners. Although, Zambia managed a good 3-0 win in their opening game, they came unstuck as their defence was broken by the Moroccans, showing a good spirit after their dispiriting opening game. Wins for Cameroon and Zambia would leave three teams on six points, wins for Egypt and Sudan would leave three teams on three  but I am expecting that neither of these scenarios happen, with Egypt not losing, while Cameroon will take the three points needed to go through. I had to watch yesterdays matches on TV, and I could not fail to be impressed by Angolas second half demolition of Senegal; it seems that in signing Manuchno, Manchester United have picked up a predator with an eye for goal and a good header. Although given the choice, I think his strike partner, Flavio is an even better player; if you get the chance, look again at the Angola goal against South Africa and see the way Flavio controlled the ball before making the pass for Manuchno to head in Sadly for someone watching a club in League-1, I know we cannot match the wages Al-Ahli of Egypt can raise for him. South Africa, fortunate in getting a point against Angola, were then shown the door by Tunisia. On Thursday, Tunisia play Angola and a single point is the best result for both teams, this would put them both through with Tunisia winning the group. Should one team win, then the loser can only be caught by the team they did not beat yesterday, as head-to-head counts first in separating teams. Hence if Tunisia win, South Africa could come second by beating Senegal, but Senegal are out even if they win. If Angola beat Tunisia, then South Africa are out, but Senegal could still sneak through. Somehow, I expect a draw. Africa’s games highlight Club and Country conflicts. This biennial tournament is well known for creating and recreating a debate on the club versus country issue, as it takes players away from their paymasters for around a month. 2.	International teams should provide insurance for players on international duty, so as compensation is paid for any player who is injured. Up to now, these demands have been refused on the simple basis that the international teams cannot afford it, but the massive amounts of cash now generated by the World Cups and European Championships have damaged the argument. The principal body arguing for the clubs has been the G-14, the oddly named group of 17 of the Worlds richest, most popular clubs, and Bayer Leverkusen. The G-14 have long been a thorn in the side for the Football Confederations, and the have a nice trick of appearing to support the little guy, for example by bring a court case on behalf of Belgium club, Charleroi who not surprisingly are not members. The case, which I have covered in this column before concerned Abdelmadjid Oulmers, who sustained an injury when playing for Morocco, keeping him from playing for his club team for best part of a year. As part of the case, G-14 asked for a massive 860 million as compensation not only for Charleroi but also for similar cases involving their own members. The monetary side of the case was dismissed by a Belgium court in May 2006, but this was only the start of things  as they then referred the issues concerned to the European Courts. A fortnight ago, a meeting between FIFA, UEFA and the G-14 clubs resulted in them agreeing to drop the case, (and other court cases), and to disband as an organisation, with the football organisations instead recognising a new 100 member European Club Association (which will include at least one member from each of UEFAs 53 states). As such an organisation will find it hard to reach a consensus unless bullied by the big clubs, this appears to be a victory for UEFA add FIFA, and a demonstration that since Platini had taken over at UEFA, the two bodies are working in unison, rather than in competition with each other. In the week leading up the the African Cup, there were two almost conflicting statements, from the secretary of the CAF, and Sepp Blatter. The CAF statement was to re-state the Federations determination to keep the tournament every two years, and to play it in January. The claim of the CAF is that a June or July date would be a problem because this is too hot in may countries, and it is the rainy season across the central belt of the continent. Only right down in the South is the weather supposedly suitable, (the 2010 World Cup, will of course be played in the South African winter). There are some problems with this claim – although it is clearly cooler in some countries than others in January, this does not mean the sport is limited to this period of time. 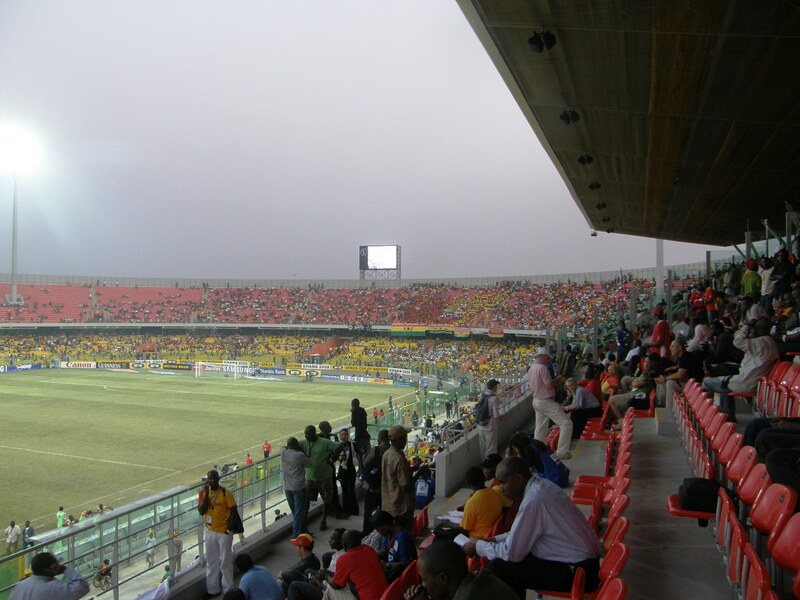 The African club competitions run on an calendar year system, with matches from February to November, while this season the federation has scheduled four rounds of world cup qualifying for June – just the time said to be too hot or too wet. The CAF statement concluded that the biennial, January tournament will continue unchanged at least until 2014. 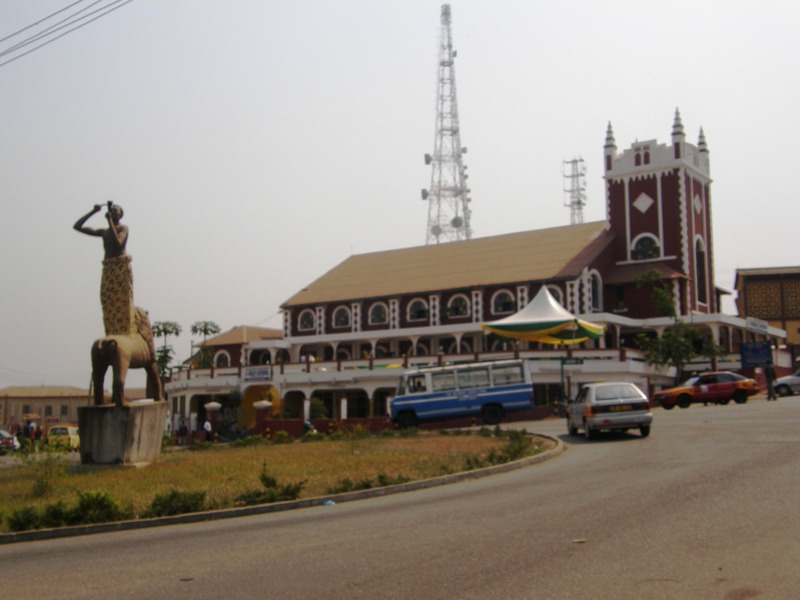 The next edition, though  in Angola will be held two weeks earlier, from January 10-31. Not that this makes a difference to the European clubs, as the main suppliers of players  France, England, Spain, Portugal all play through this period  only Germany which restarts its top division in the first week of February would be helped by the decision. 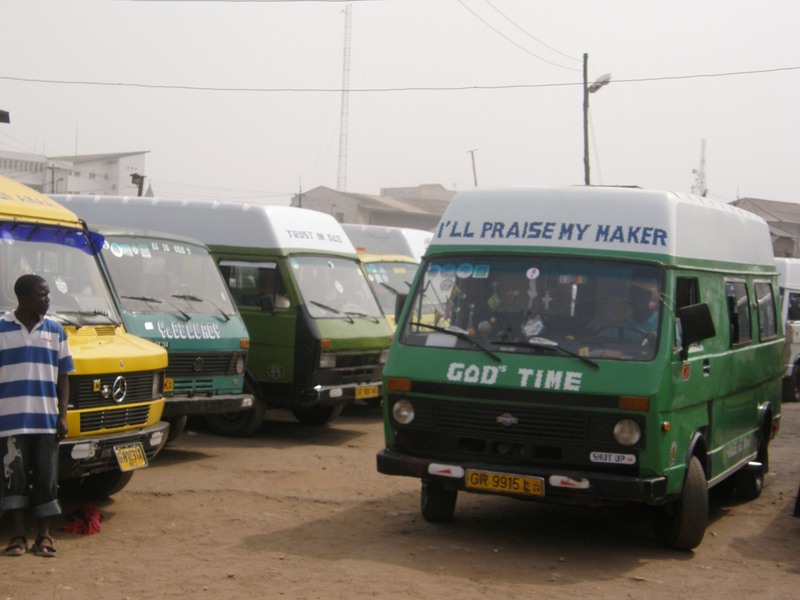 Public transport in Ghana is only recommended for those of a quiet disposition and even temper. There are two main means of inter-city transport, the buses or the tro-tros. A bus is an easy option, tickets are on sale in advance, with a timetable (even though it is likely to be ignored). The tro-tro is the popular method of transit though. These consist of mini-buses which can squeeze in 22 passengers. They run without a timetable  you just go to the station and take a seat on the one heading to your destination. The bus simple starts when it is full, which when travelling between the two main cities, is never going to be a long wait. This does not actually describe the chaos one has to navigate to get through the tro-tro station. At the entrance, you are met by various touts trying either to divert your attention to some other (more expensive and unlicensed) form of transport, or to direct you to the correct bus, in return for a small tip. You then get on a half full bus, which slowly becomes fuller and more cramped. Outside, hawkers are selling everything you may need for the trip from a plastic bag of water, to ladies underwear, all carrying their wares in baskets on their heads. The noise was intense and those near the windows acted as middlemen, passing coins and goods through. For the record, the only thing I bought was water. The road from Accra to Kumasi is not a poor road at all, and is all properly surfaced except a couple where works were in progress. As you go away from town, all you can see of the villages tends to be a number of commercial properties to the road, residences could be spotted through the trees but the red dirt tracks that led to them were not always visible. It did not appear that much if any of the land was under cultivation, and livestock was also absent from my view. This appeared to change in the last 100 km, as we moved into the Ashanti province. Here the villages appeared bigger and great red tracts of earth marked the roads up to the housing. 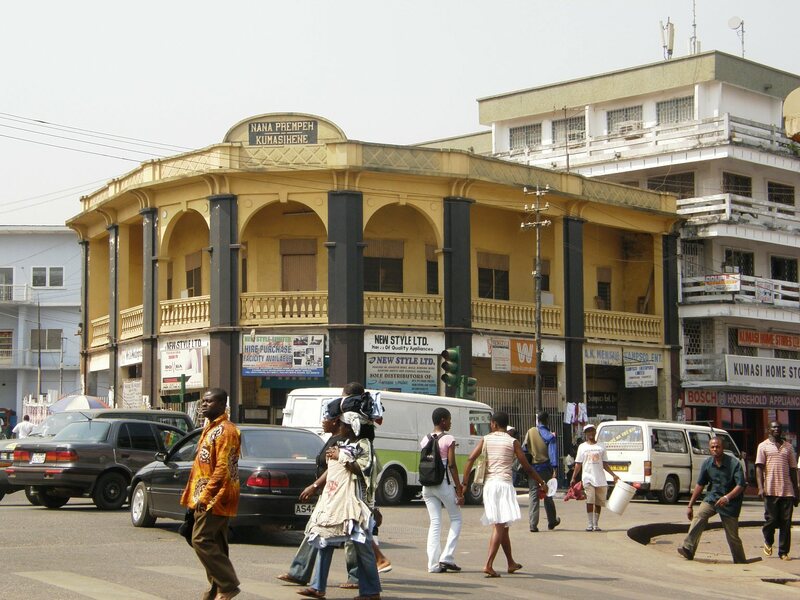 Eventually after five hours in the bus we arrived at the busy feeling city of Kumasi. 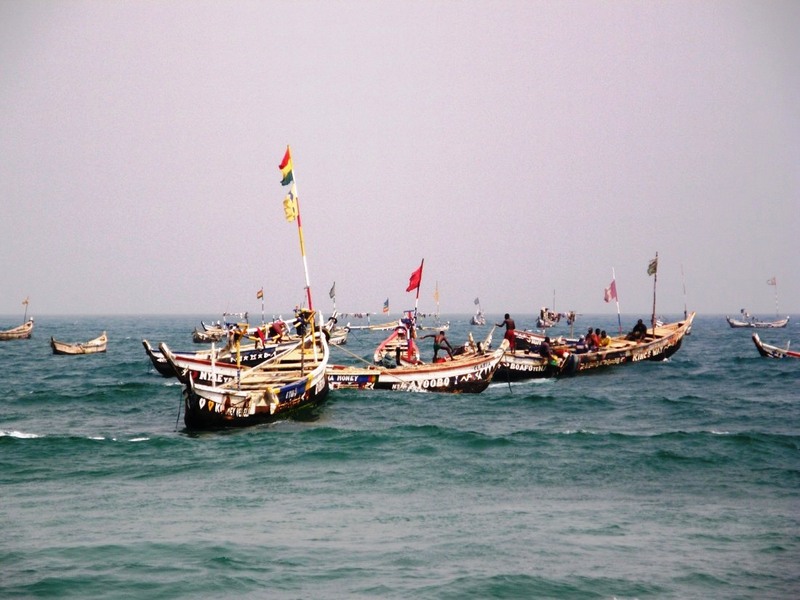 Without the sea breezes enjoyed by Accra, it felt a much hotter town. With the various members of our party at odds about our plans, and in which order to do them in, I did not get a good look around the town, but a simple walk down one busy street. Still, I am due to return here later, so next time I may get a look around. 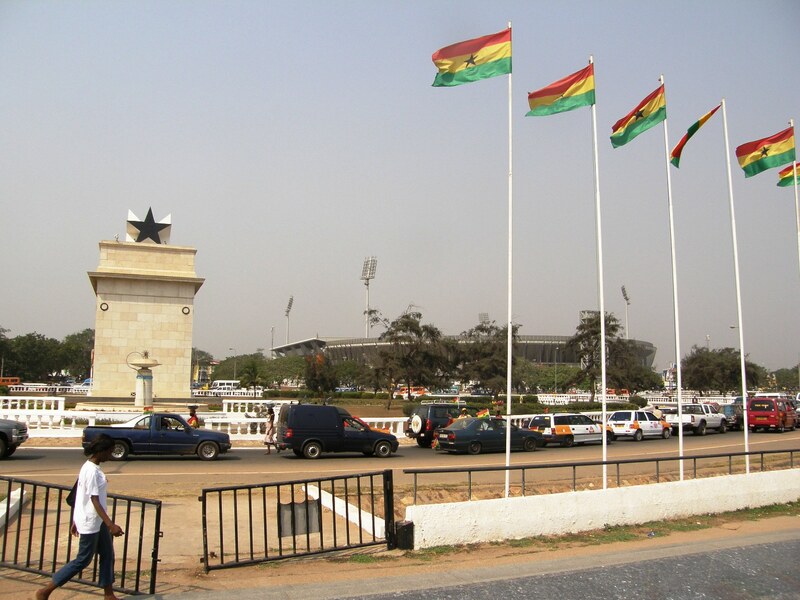 At the stadium, I talked to someone who had come up on the bus from Accra. Far from running to the timetable, it actually left about two hours late  and my friend had taken the official advice to arrive a full 60 minutes before scheduled departure. 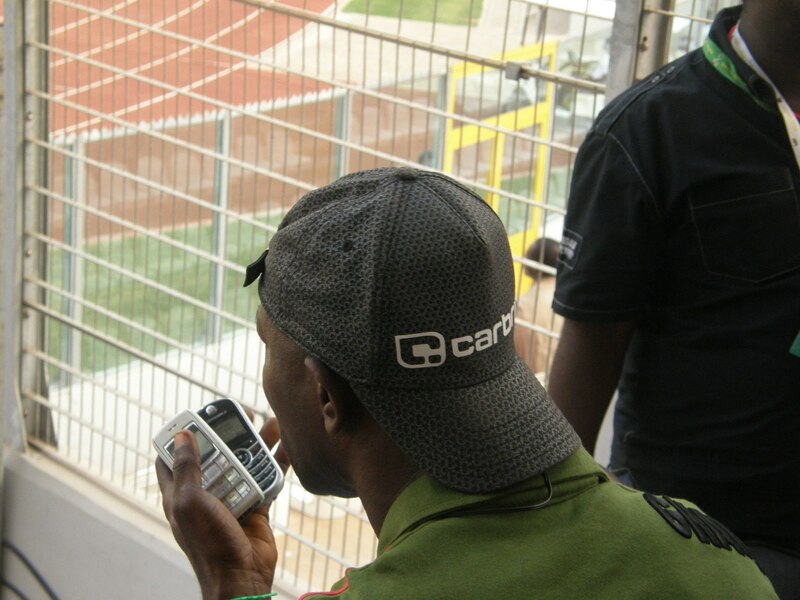 He came close to missing the start of the matches in Kumasi. The stadium is based on a single tier built up quite high over around half the pitchs circumference, and then dropping lower for the curve behind the south goal. This has the scoreboard positioned above it. 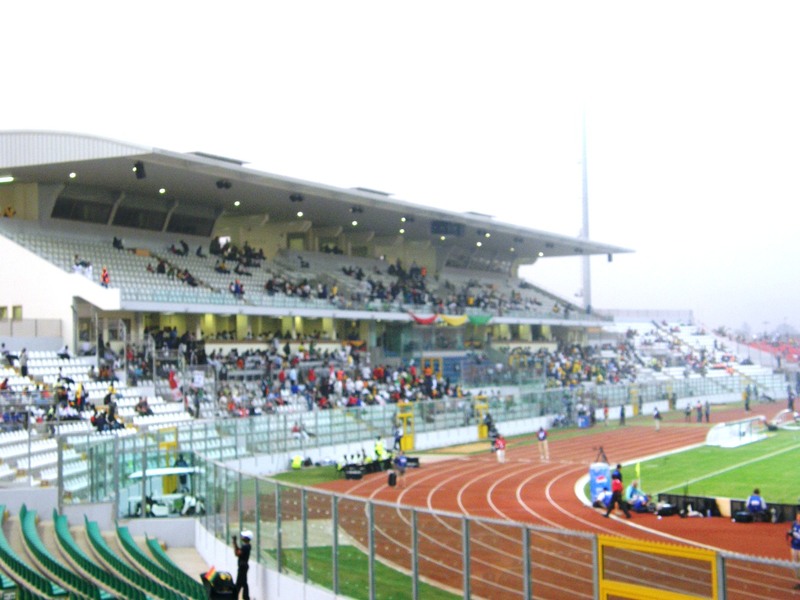 A very modern stand runs down one length of the ground, and this is where I was watching from. The capacity is given as 20,000 and I would say it was well over half full for the game. The popular areas are behind the goal and these were closed to full. The more expensive seats along the side did not appear to have much over 50% take up. Again, the stands come down low to the running track level, and although a clear plastic is used for the fencing, you need to be at least a dozen rows back to secure a good view. Anyone missing out can console themselves with the news that overuse of fencing, both wire and plastic means that many of the VIP seats in the stand, and certainly the corners of the press box also do not enjoy good views. Egypt picked a very domestic team, with eight players in the local leagues, joined only by Zidan (Hamburg), Shawky (Middlesbrough) and Gomaa (Al-Siliya in Qatar). Cameroons squad was international, or to be accurate European in its base. Geremi (Newcastle) and Andre Bikey (Reading). Samuel Etoo of Barcelona led the line, while Idris Kameni, the keeper is with cross city rivals Espanyol. The French and German Leagues provide 3 players each, and Rigobert Song now plays for Galatasaray. The Hamburg forward Mohamed Zidan, playing just behind the front two appeared to be the most dangerous player in the early stages, failing the find a shot when in space in the second minute. In the 12th minute he broke right and fired the ball across the face of the goal. Everyone missed this, but Abdel Moteleb was beyond the far post, and his attempt to cross it back in was met by a hand. Moteleb himself took the penalty, stopping a pace short of the spot on his first attempt, which the referee rightly deemed as unacceptable, and then thundering in a second attempt. Three minutes later Zidan again was on the ball, this time scoring to double the lead. Despite playing an attacking variant of 4-5-1 where the midfielders play a V with Stephane Mbia at the base, and the two wingers, both pushed up in support of the Etoo. Cameroon failed to make any impression on the Egyptian defence in the first half. A defence that one felt looked somewhat more secure than it had done at the start of Egypts run to win the title two years ago. Egypt played with three centre halves, a four man midfield, and Zidan, as I have already mentioned behind the front two. Cameroons failure in trying to gain the initiative in midfield led to them replacing Jean Makoun by Benficas Augustin Binya eight minutes before the break. Having taken the early double lead, Egypt did not manage to create many more chances in the first half, but had little trouble stifling any creativity from Cameroon. The without warning, in the second minute of injury time, Zidan struck again and the holders were 3-0 up. 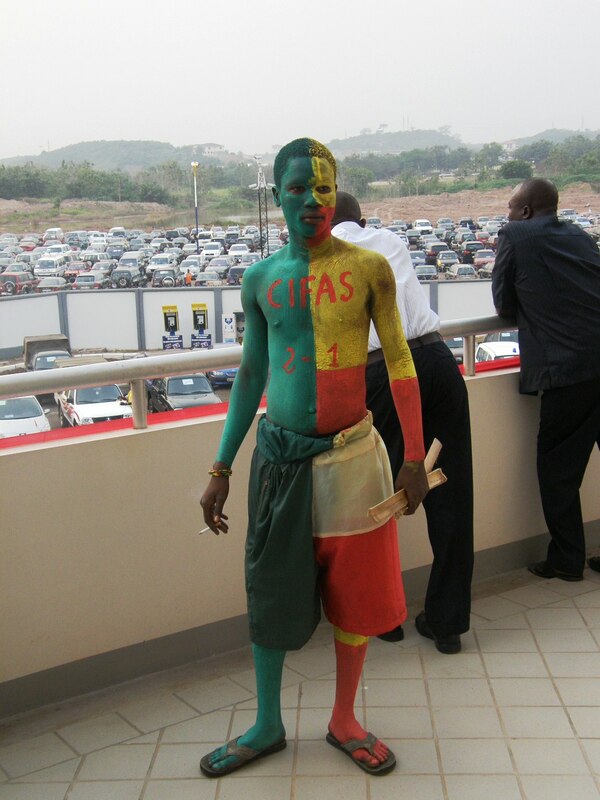 Cameroon tried a further double substitution at half time to try and revamp their midfield. On came Achille Emana of Toulouse and Arsenal youngster Alexandre Song. This brought a quick return with the ball finally being delivered to the wing. Gerermi overlapping on the right and providing the cross for Etoo to score in the 50th minute. Although after this, the crowds preference for Cameroon became audible whenever they attacked, (and most of the attacks were coming through Geremi on the right wing), Egypt did not appear to be greatly troubled, still they took off Zakry Mansour from the attack and star player Zidan and took a more defensive stance. The second game is to be an African affair. Sudan are the only team to use local players only in their team, and indeed only two clubs are involved. League champions Al-Hilal provide seven of the eleven, while runners-up (and cup winners) Al-Merrikh provide the rest. Zambia have a single player, Joseph Mulenga of Strasbourg playing in Europe. 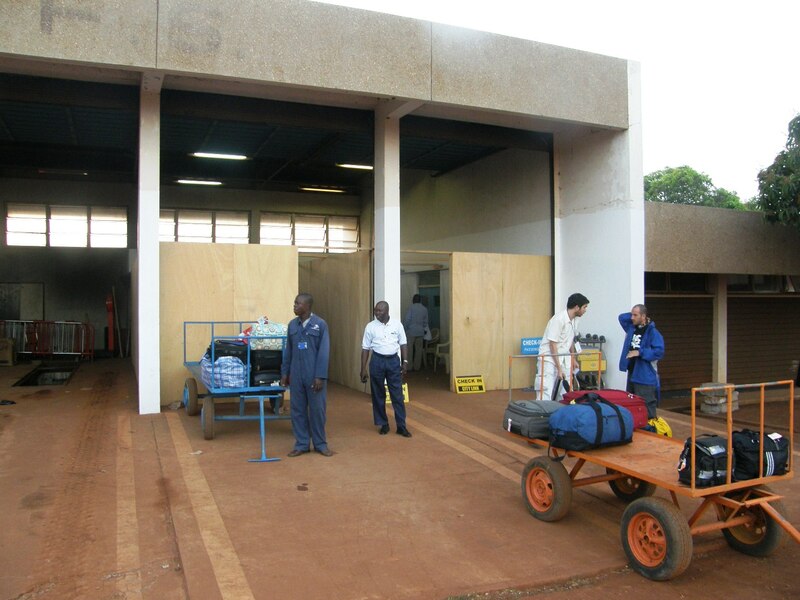 Three of the starting line up play in Zambia, and another three in Angola (all for Primerio de Agosta). The remaining quartet play in the South African League. The crowd did thin out during the break between games, but I would say that well over half stayed in place. Zambia attacked from the off, and were rewarded quickly with James Chamanga opening the scoring in the second minute. Chamanga threatened again as Zambia took most of the opening stages, but a shot from Bader Galag flashed across the goal in the 12 minute, striking the far post and warning that Sudan were not to be taken too lightly. As the half moved on, we saw more signs that the Sudanese were not here just to make up numbers, while the Zambian were attacking less, and were being pushed onto the back foot. Faisal Agab shot narrowly wide on the half hour mark, as Zambia struggled to contain Sudan. At least any embarrassment suffered by the team may not be so easily noticed at home. 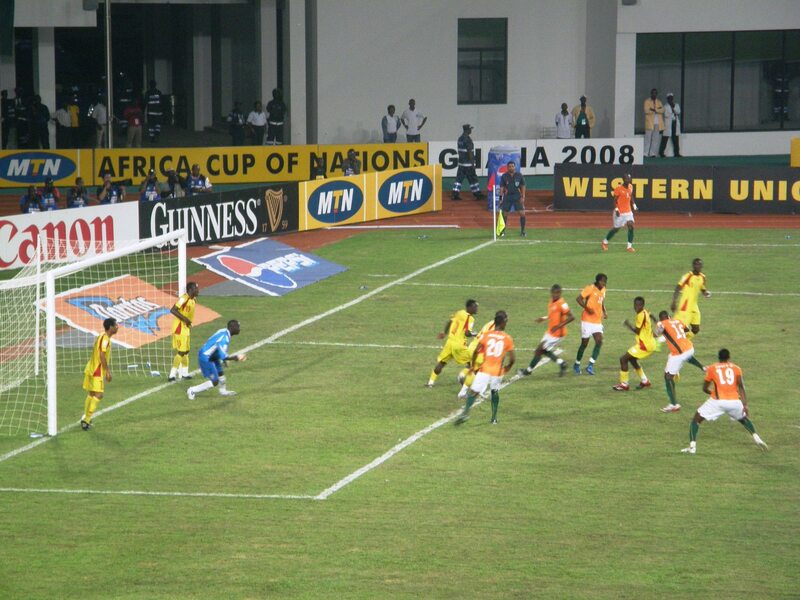 Zambia, along with Nigeria were the most prominent of a number of countries affected by a big increase in the cost of TV rights for this tournament, the Zambians were reportedly asked US$1.5 million for coverage, ten times what they expected to pay. The result is that the matches can only be seen by those with satellite TV. The second half started with Sudan still trying to break down the Zambian defence, but they fell again to an early attack  a little confusion in defence and the ball is shifted towards the post when Mulenga heads in the second goal, they added a third in the 59th minute, putting the result beyond doubt, this time through Felix Katonga. There was a further drift in the crowd as the chance of a shock receded, but there was no time during the paid of games when the stadium did not echo with the sounds of drums and trumpets, while the love of the underdog was shown by a roar whenever Sudan attacked. Why does one travel? Is it because we reject the ideas of an ordered world and seek something more chaotic, something less within our own control? 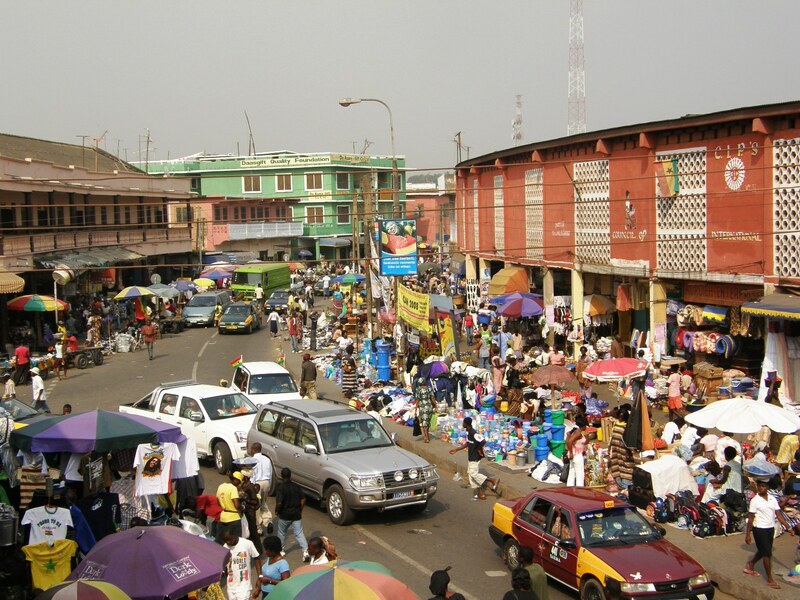 There may be long queues at Gatwick, but the flight to Accra is uneventful. Apart from an aircraft with the word Ghana painted on the side, but the logo of Icelandair painted on the tail and wing fins, and that they have to play the film soundtrack on the public address (no headphones), Ghana International is not really any different to any other airline. Even Accra airport will not immediately stick in the mind  we passed through customs quickly, and then waited for our luggage. We wanted to check a reservation with an internal airline, which meant a trip from the International to the Domestic terminal and back. We picked up two unwanted guides, who were less than satisfied when we only reluctantly offered a 5 Cedi (£2.50) tip. They were trying to guide us to their choice of taxi, when our hotel had sent a car to pick us up. Or at least we thought they had. When we found the hotel driver, he was holding up the name of another passenger, coming in on another airline. We high-jacked him anyway and got down to the hotel, finding out that he was due to take the other passenger first and then pick us later, as the hotel had a two hour error in the time they were expecting our flight to arrive. On of the complaints we had heard in advance was that there was a shortage of hotels in the city, leading to a big hike in room rates. To be honest, my hotel would not have deserved the two star rating, and US$66 per night that it normally charged  even if it had been placed in the centre of one of Europes more expensive cities. At US$90 during the tournament, it was a real rip off  and yet it was doing better than most. 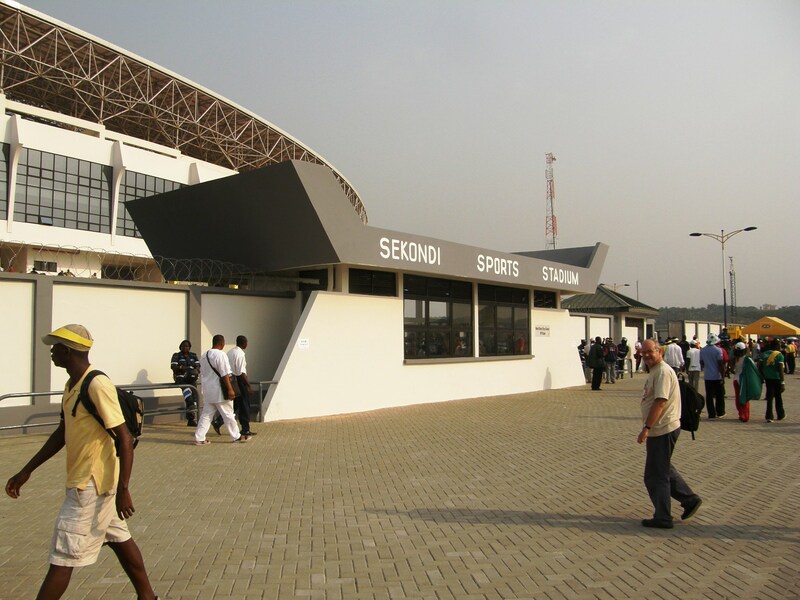 We picked up the details of the opening game at the airport, the number of visible staff were less than one might expect  but after we had waited ten minutes for our luggage, we heard a cheer from various offices around the areas perimeter  Junior Agogo had won a dubious penalty for the hosts, and they had gone one up. This did not last, but a late goal by Muntari restored the home advantage allowing them to start with a win. The result, when we reached the city centre was a fever pitch of celebration. Cars and bands of supporters would make their way, creating as much noise as possible. Friends coming off a later flight were staying in another part of town, and our taxi to meet them managed to co-incidentally arrive at exactly same time. A beer was had in the hotel, and then a walk up and down the local drag, past a number of other bars, and nightclubs. As we walked along the road, a few of the locals greeted us, while one young girl attached herself rather strongly to me. Not only did she follow us right back to the hotel, but suddenly as we sat down in the bar, more young ladies appeared from nowhere. My friend from West Bromwich immediately took fright and ran off to his room. Once it was clear there was no profits to be made from our party, our friends did disappear, but we did get more offers while we tried to negotiate the taxi back to our own hotel. It took the full morning of the following day to sort out my accreditation. Apparently in order to reduce the chaos that the system had suffered from on the first couple of days, it was necessary to send everyone from the accreditation centre to a hotel in a different part of the city, and then back again before a pass could be issued. The pass only allows one to get to the stadium media centre to apply for the daily match ticket! Completely full to see the hosts and the opening ceremony, only a few hundred had ventured out for Namibia v Morocco, allowing a clear view of the two tiers of seats in this modern stadium, refurbished specially for the tournament. Although bright and sunny, the Ohene Djan Stadium lies only a short distance from the shore, and a cooling breeze meant that we did not feel the full force of the mid afternoon temperatures. The two ovals of seats with large curves behind the goals gives a very spacious feel to the stadium, and even though there is no track, the lower seats at the ends will provide poor views of the action. Not surprisingly, these seats were not in use in this low crowd. AN unusual feature is the holes, apparently cut out of the upper tier to allow the four tall floodlight pylons to rise from anchor points below the lower tiers. The uneven size of the holes convinces one that they were the quick answer to an unplanned problem for the architect. Only one side of the ground has any cover, – a high cantilever stand in steel. There is a slightly curious net curtain affair below this, which I would guess is provided to try and persuade birds from nesting among the steel beams, or at least if they do, to protect the seats below from the evidence. In contrast to the bright colours of the stand, the pitch was a very uneven mixtures of light greens and browns that did nothing to hide and uneven bounce. Morocco started in 4-4-2 formation, although they showed a degree of flexibility up front  only Bordeauxs Maroane Chamakh was committed full to the attack, his partner could be either Youssef Hadji (Nancy) or Soufienne Alloudi (Al-Ain, UAE), with the other moving out to the right wing. Four of the Moroccan squad play in the French League, two in UAE, the goalkeeper is local with Raja Casablanca, while the Ukrainian, Bulgarian and Portuguese leagues are represented. Youssef Safri of Southampton is the only man on the pitch that plays in England. The Namibians on the other had rely mainly on their own league, which provides four players, and the South African, which adds another four  Oliver Risser is unattached leaving only Norman Jacobs (Bryne, Norway) and Collin Benjamin (SV Hamburg) playing in Europe. They adopted a 4-1-4-1 formation which soon proved inefficient at holding back some quick Moroccan attacks. In the second minute, Chamakh raced through the defence and although his shot hit the post, he reacted quickest and passed square to give Alloudi a tap in. Alloudi was on hand in the fifth minute, just beating the goalkeeper to the ball and doubling the lead. To their credit, Namibia did not collapse completely after this double set back, and even gained a little of the ball  still it was against the run of play when Brain Brendall cut in the right wing and unleashed an unstoppable shot to bring them back in the game at 2-1. This did not last long though  five minutes later Tarek Sektioui, crossed from the left wing, and Alloudi was unmarked to head in at the far post. The noise in the ground was provided not by supporters of either side, but by a group of about 200 home supporters, almost in a uniform of bright yellow shirts, a mixture of brass band, and dancing provided the colour. The only Moroccan supporters I could see were a small number who ran back and forth with a giant flag whenever they scored, while less than 100 from Namibia were trying not to look dispirited in the far corner. They had little reason for hope, as every Morocco attack seemed like a goal opportunity. In the 38th minute, the Nantes full back overlapped and was fouled (but only very gently) and giving Sektioui the right to increase the score to 4-1 from the penalty spot. The second half started a little scrappily with the injury milk float twice called into action. Alloudi being the victim of Namibias indiscretions. Namibia brought on Abraham Shatimuene at half time, allowing them to re-organise the defence (without any obvious effect, other than meaning the Angolan league was now represented). For Morocco, Youusef Mikhtari who now plays for Al-Rayan in Qatar replaced the injured Alloudi on the hour mark. The pattern continued with Namibia defending somewhat desperately, and building up a collection of yellow cards, Morocco were dominating the play, but not actually producing many credible chances. Set pieces seemed to be the best opportunity, and this was proved in the 73rd minute when a corner was delivered deep to newly arrived substitute Monsef Zerka (who had replaced his Nancy team mate, Youssef Hadji) to head in number 5. Both sides pushed forward in the last fifteen minutes, but the match had one out of steam. Morocco settling for this very comfortable start, and knowing that neither of their other games is likely to be this easy. The lists are in, and 388 players are making their way to Ghana for the African Cup of Nations which starts next Sunday. The biennial event continues to annoy the coaches of many a European team, as they lose their players for a month  but it is these players that the fans and the worlds media will be filling the stadiums to see. TV viewers will be able to see the matches from England, so long as they have some type of cable/satellite/digital set. The matches are being shown on Eurosport, and on the BBCi services, with highlights programmes on BBC3. I do not know if I would want to watch two back to back matches every night on TV, but if I was not in Africa, I may well have my set tuned for those highlights at 7pm every night. No doubt all the major clubs will have their scouts in position as well, but they are not interested in the stars of the Premiership. Slightly more than a third of the players in these championships still ply their trade with African clubs, and many know this is the place to get noticed and open up for the dream move to Europe. There are 112 players, out of the 368 total that play for home country clubs, with another 30 playing within Africa, most notably in South Africa, where 9 Namibians, 5 Zambians and one player from Benin are playing. Most of the rest play in Europe, with the French supplying 57 of the players, and England proving 41. There are also a handful of players who have with teams in Arab states around the gulf, and one each playing in the USA and Mexico. Sudan is the only country that only uses players from within their local league. Indeed they select from only two clubs, with 12 players from local league champions Al Hilal, and the other 11 from Al Merreikh  who finished as runners-up in the league and beat their rivals in the domestic cup final. 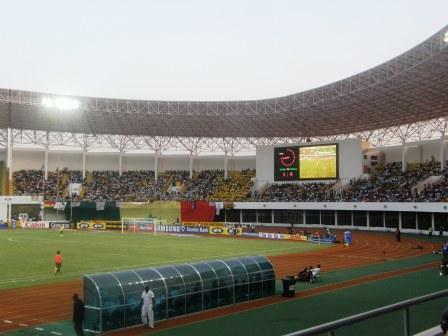 Sudan are considered to be one of the weakest teams in the competition. This may be unfair as they finished ahead of 2004 champions Tunisia in qualifying. Should Sudan achieve anything this year, then several of their players will be closely watched. Sudan also provides a single player, Elijah Tana of Al Merreikh to another squad, in this case Zambia. 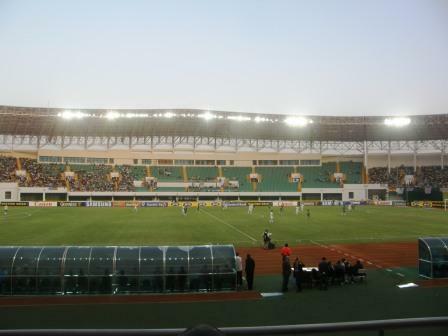 At the other end of the chain, Nigeria is the only country that selects its squad entirely from outside its own borders  seven Premiership players make this the most Anglo-centric of the squads  Yobo and Aiyegbeni of Everton, Utaka and Kanu of Portsmouth, Obi from Chelsea, Martins from Newcastle and Etuhu from Sundaerland are joined by Shittu (Watford) and Olofinjana (Wolves). The Nigerian team is spread across the UEFA nations, with four in France, but also players in Israel, Romania and Bulgaria. The only player representing the Nigerian League in the tournament will be the Benin goalkeeper, Chitou Rachad. 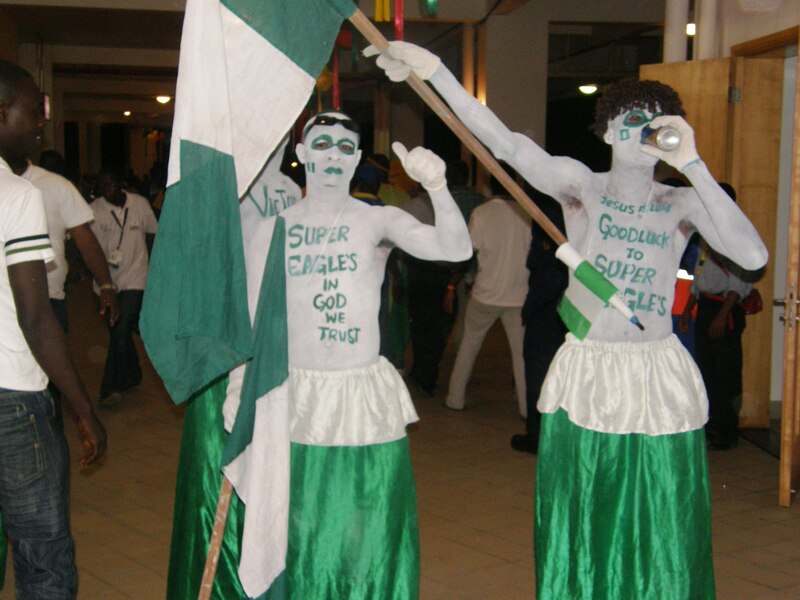 Naturally, the Nigerians are expected to be among the favourites. The Benin squad is also widely spread, with just one playing in England  Romauld Bocco who is a defender with Accrington Stanley. Their squad also includes a player from Serie D club Casale in Italy, and the player coach, Alain Gaspoz from Bagnes in the Swiss 2nd Amateur Liga (which is the fifth level of football there). Recent winners Egypt and Tunisia, along with South Africa are all looking the their own leagues to make an impact. The Egyptians have chosen 17 local players, the South Africans have 15 and the Tunisian have 12. Egypt also play Mohamed Shawky from Middlesbrough, Tunisia play Rahdi Jaidi and Mehdi Nafti from Birmingham City, while South Africa use Steven Pienaar and Aaron Mokoena of Blackburn  but not his team mate Benni McCarthy. The South African team are gearing up for their home world cup, more than this tournament, and have not impressed in recent African cups anyway. Egypt and Tunisia, having both won at home, need to show their mettle south of the Sahara, and their players have experience of this in the African club competitions. The Ivory Coast and Senegal  both of whom will be listed with the favourites use seven players from England each. The Ivorians include Emmanuel Eboue and Kolo Toure of Arsenal, Abdoulaye Meita of Bolton, Emerse Fae of Reading, Didier Zakora of Spurs, plus Didier Drogba and Salomon Kalou of Chelsea. There are also six from the French league and four from the Bundesliga in a squad whose only local player is a goalkeeper. Senegals local player in Lamine Diatta, only listed as such because he is currently without a club. Readings Ibrahima Sonko is hoping to make his international debut in the competition, while also included are Habib Beye and Abdoulaye Faye (Newcastle), Papa Bouba Diop (Portsmouth), El Hadji Diouf (Bolton) and two Kamaras  Diomansy of Fulham and Henri of West Ham. Home advantage is important in Africa, and I expect the hosts  who have won the tournament four times before (twice at home) to do well. They have selected Birmingham goalkeeper Richard Kingson, along with John Pantsil (West Ham), Michael Essian (Chelsea), Sulley Muntari (Portsmouth) and Junior Agogo of Nottingham Forest. 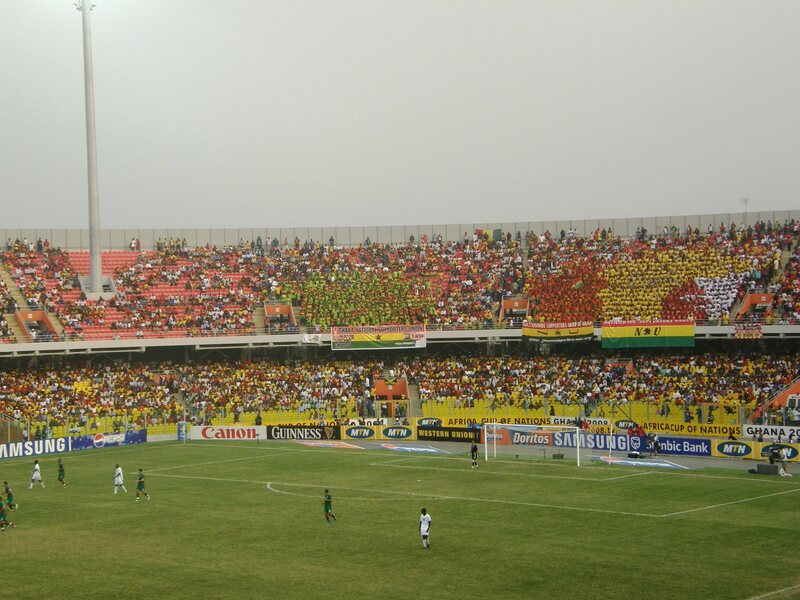 The Ghanian squad also includes three locals, and what at first glance appears to be the two travelling the furthest for the tournament, Alhassan Illiasu and Baffour Gyan  both of FC Saturn. This turns out not to be from the ringed planet, but from Oblast, somewhere near the Moscow ring-road. Hence the longest travelling player for the tournament is probably Bouna Coundoul, the Senegalese goalkeeper who also keeps for Colorado Rapids in the USA, although Alain Nkong a midfield with Mexican side Atlante, and part of the Cameroon squad runs him close. Cameroon are the last of the sides to mention who I think have a chance of winning, and they will depend a lot on star forwards such as Barcelona; Samuel Etoo and Jaseph Desire Job, well known in England, but now playing for Nice. Cameroon can field Andrew Bikey of Reading, Geremi of Newcastle, or Alexandre Song of Arsenal. A second player listed as from Arsenal is Paul Essola, but as that is Arsenal Kiev, the London club do not lose another. Cameroon also have a player at FC Saturn, and just the one in the local league, not unsurprisingly a goalkeeper, Javier Mbarga. Frederic Kanoute, now with Sevilla is the most well player in the Mali squad  and he is confident enough that he is going to turn up for the tournament. (He has retired from internationals at least once in the past, returning when the team qualified for a tournament, but did play his part in qualifying this time, including the away goal in Togo that put Mali through, and Togo out of the competition). The English representatives in this side are Momo Sissoko of Liverpool and Stokes Mamady Sibide. The Mali squad has six players in the French league, and a second player Mahamadou Diarra of Real Madrid in La Liga but it also features players who play in Morocco and Algeria. The final two players travelling to Ghana from England are safri Youssef of Coventry and Morocco, and Rui Marques of Leeds United and Angola. The Moroccan squad features four players from local leagues, and six from France, but otherwise has very diverse call-ups. The Angolans will depend a lot on the Portuguese league, seevn of the 13 players travelling from Portugal will play for Angola. Apart from Sudan, the Englisg league is not represented by Namibia, Zamabia and Guinea  both Namibia (9) and Zambia (10) have a high concentration of local players in the squad, as well as the large numbers based in South Africa. Guinea will depend a lot on the French league, and also have a big contingent playing in Turkey. 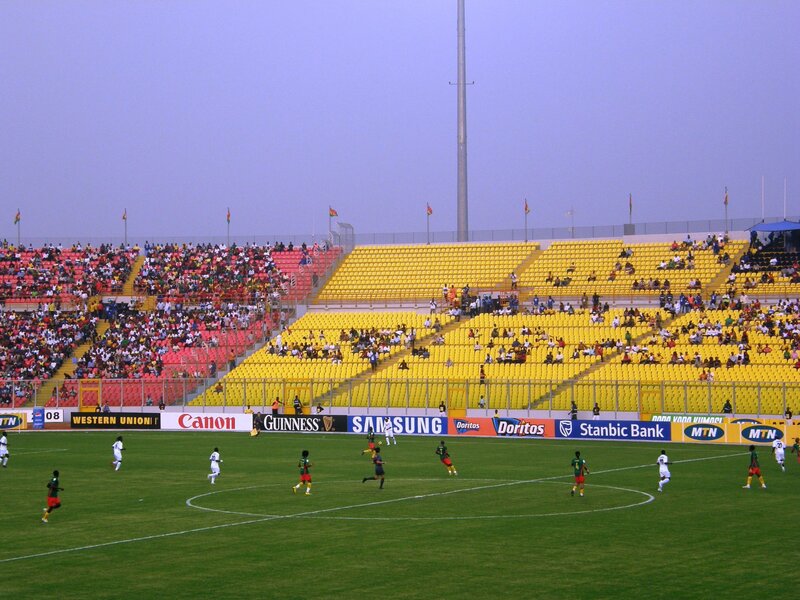 Group A will feature the hosts Ghana, along with Guinea, Morocco and Namibia. With home advantage, Ghana are big favourites to take this group with most eyes on the match between Guinea and Morocco to see who joins them in the next round. Few people rate Namibia. Ghana will need to hit the ground running though, as if they lose points in the opening game against Guinea, theire position will be immediately under threat. Group B features Nigeria, Ivory Coast, Mali and Benin. Nigeria will play the Ivory Coast in the first game, and the winner will be favourite to win the group. Personally, I do not see either of the others as strong enough to qualify. Group C. Egypt, Cameroon, Zambia and Sudan. Again the biggest match, Egypt for Cameroon comes first. This may not be the end of the group though, as the Zambian team may well be the dark horse of the tournament, and could go through at the expense of the current holders. Group D features Tunisa, Senegal, South Africa and Angola  and I feel that both Tunisia and Senegal who meet up first should qualify. My pick for the semi-finals are Ghana, Ivory Coast, Cameroon and Senegal. As I have chosen one from each group, I am also picking these as group winners. I have not selected any north African sides for the last four, although I expect Tunisa and Morocco to reach the knock out stage. All these four are capable of winning the tournament, and I would not like to pick. I will put up one thought for consideration, home advantage is important in Africa  Egypt and Tunisia won the last two tournaments on home turf, and Ghana have won the tournament four times in the past  twice as hosts. You are currently browsing the archives for the CAN 2008 category.